Make your kitchen the heart of your home with Dream Doors Torquay. Speak to our designers and view our stunning collection at your local kitchen showroom in Paignton, which also services Newton Abbott and surrounding areas. A great kitchen is the heart of any home, so make your dream a reality with help from your local kitchen experts at Dream Doors Torquay & Newton Abbott. From design to fit, our professional team will help you create your ideal kitchen. 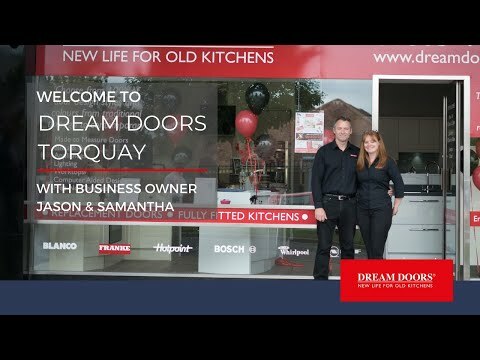 Jason and Samantha, owners of Dream Doors Torquay, will be on hand to help you create the perfect kitchen for your home. In our showroom you will find designs and styles, ranging from classic to contemporary, so you can find the inspiration you need to makeover your kitchen. Jason and Samantha will be happy to talk through your ideas and help you design and build a practical but stylish kitchen that serves your everyday needs. At the Dream Doors showroom in Paignton, we house kitchen cabinets, worktops and appliances so you can see what is on offer, from monochrome kitchen spaces to traditional country styles. Classic and contemporary kitchen design doesn’t have to involve the replacement of an entire kitchen. New kitchen doors and worktops are an affordable option that can transform the overall look and feel of your kitchen. Even if you want to swap styles completely to a monochrome or high gloss finish, this can all be achieved on a budget with help from our expert design team. With us, you can achieve your dream kitchen for up to 50% less than the cost of a full kitchen refit. Why not pop into our Torquay showroom to see what is on offer? Jason or Samantha can visit your home to help you plan and design your new kitchen. Simply arrange an appointment so he can come and take your ideas on board and provide you with a free, no obligation quote. These visits are useful to help our kitchen designers understand your requirements and bring functionality into your space. Dream Doors Torquay offers replacement kitchen doors, worktops and fitted kitchens to all local TQ postcodes and surrounding areas. This includes but is not limited to Torquay, Teignmouth, Dartmouth, Kingsbridge, Salcombe, Totnes, Ashburton, Paignton, Newton Abbott, Bovey Tracey, Brixham, Buckfastleigh, Chudleigh, Dartington, Kingswear, Stoke Gabriel and South Brent. Please call to discuss your requirements. "Negotiation of contract, pre-planning survey and other arrangements were excellent, supervision of fitters also very good." "Very nice. They were good and tidy. Very pleased with work. My kitchen looks very nice and clean. Thanks for the lovely job you did." "We found this company excellent, they took time with my mother and got the job in one day so she had little upheaval."